Preheat the oven to 165°C/325°F. Line 20cm (8in) square baking pan with foil, pressing foil firmly against pan sides and leaving 5cm (2in) overhang. Butter the foil. Melt butter in medium saucepan over medium heat. Continue cooking until butter stops foaming and browned bits form at bottom of pan, stirring often, about 5 minutes. Remove from heat; immediately add sugar, cocoa, water, vanilla, and salt. Stir to blend. Let cool 5 minutes (mixture will still be hot). Add eggs to hot mixture 1 at a time, beating vigorously to blend after each addition. When mixture looks thick and shiny, add flour and stir until blended. Beat vigorously 60 strokes. Stir in nuts. Transfer batter to prepared pan. Bake brownies until toothpick inserted into center comes out almost clean (with a few moist crumbs attached), about 25 minutes. Cool in pan on rack. Using foil overhang, lift brownies from pan. Cut into squares. Brownie can be stored in an airtight at room temperature for up to 2 days. Oh chocolate take me away! 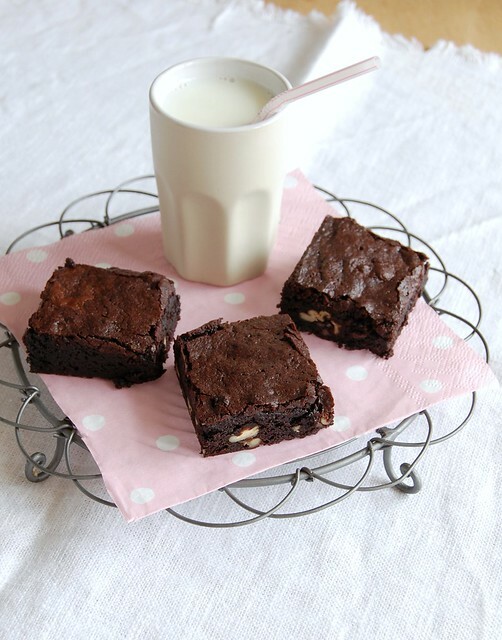 Yum I love brownies, yours look absolutely delicious!